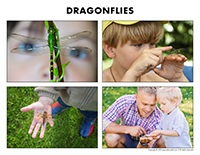 Explore the world of dragonflies with our circle time suggestions, workshops, game ideas, early science activities, and a fun new rhyme. 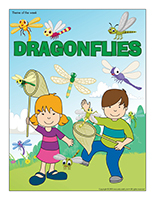 A picture game, activity sheets, coloring pages, a positive reinforcement tool, a lotto game, and many other dragonfly-themed documents! 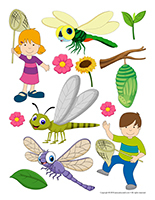 (Open educa-decorate-Dragonflies) Print, laminate, and cut out the illustrations. Use them to decorate your walls and set the mood for the theme. (Open models-Dragonflies) Print and let children decorate the items. Cut them out and use them to create a garland that can be hung within your daycare or near your daycare entrance. 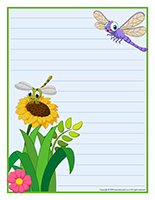 (Open stickers-Dragonflies) Print on adhesive paper and use the stickers for various projects throughout the theme. Create a fascinating centrepiece by inserting a string of white Christmas tree lights in a clear container to represent fireflies. This tool was created in response to a special request received. (Open group identification-Dragonflies) Print and laminate the posters and illustrations to identify children’s places and belongings. (Open Poni discovers and presents-Dragonflies) Print and laminate. 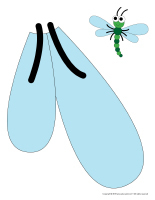 Show children the different parts of a dragonfly using a Poni puppet (or another puppet that your group is familiar with). Have you ever seen a real dragonfly? Where do dragonflies like to hang out? What color is a dragonfly? How many legs does a dragonfly have? Can you name things that fly and other things that can’t fly? Do dragonflies know how to fly? (Open picture game-Dragonflies) Print and laminate the pictures in the format you prefer. Use them to spark a conversation with your group and ask them questions about your theme. The pictures may be used as a memory game or to spark a conversation with the group. Use them to decorate the daycare or a specific thematic corner. 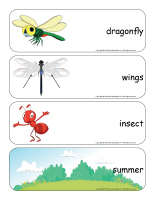 (Open picture game-Dragonflies) Print, laminate, and store in a “Ziploc” bag or in your thematic bins. 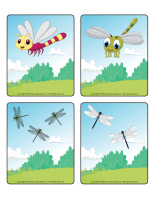 (Open picture game-Dragonflies) Print the pictures twice and use them for a traditional memory game. 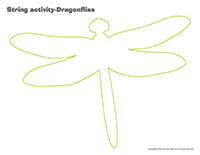 (Open activity sheets-Dragonflies) Print and follow instructions. 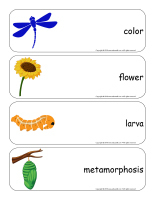 (Open writing activities-D like dragonfly) Print for each child or laminate for use with a dry-erase marker. (Open stationery-Dragonflies) Print. Use the stationery to communicate with parents, in your writing area, or to identify your thematic bins. 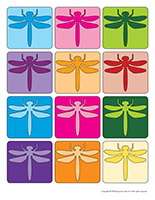 (Open educa-nuudles-Dragonflies) Print for each child. Have children color the sheet and use Magic Nuudles to give it a three-dimensional look. Variation: You don’t have Magic Nuudles? Have children fill the spaces designed for Magic Nuudles with bingo markers or stickers. To order Magic Nuudles. 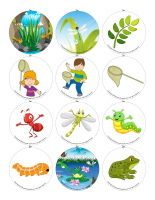 (Open string activities-Dragonflies) Print for each child. Children trace the lines with glue and position string or yarn on the lines. Green straw (from Easter baskets) in a shallow container with plastic insects. Offer only green, black, brown, and red blocks children can use to build giant insects. Assembly games (K-Nex or Magnetix) children can use to create giant critters or silly insects. Drinking straws that can be inserted end to end to create bridges for insects. Attach plastic critters (or jelly worms) to a fishing rod and dip them in paint to make impressions on paper. Make insect crowns! Use a strip of paper and add antennae. A roll of toilet paper, pipe cleaners for antennae, and a small quantity of paint can easily become a bee or a butterfly. A butterfly model and crumpled pieces of tissue paper that can be glued all over it. A butterfly or dragonfly shape traced on a clear plastic cover sheet, colourful sand, and glue to create a fun stained glass decoration. Two paper plates (one cut down the centre), a fastener, and red and black paint for creating a ladybug. Two egg carton sections, wiggly eyes, black and yellow paint, wings, and antennae to create an adorable bee. Use Honey-Comb cereal to represent a beehive. Pink, brown, and black paint for creating a worm collage. Paint critters with glow-in-the-dark paint. Use a series of egg carton sections to represent a caterpillar. Yarn and poster paint for “worm painting”. Use empty toilet paper rolls and cellophane paper to create binoculars. Insect, flower, and gardening-themed stencils. Create a beekeeper corner. You will need a pith helmet with a veil, a rain suit, a few plastic bees (or other biting insects), a large square box (that will become a beehive), and a few simple instruments (shovel, watering can, etc.). Offer an insect hunting area. 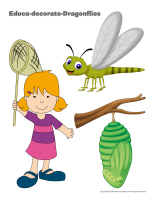 You will need butterfly nets, containers, plastic insects, binoculars, fact sheets to help children identify insects, magnifying glasses, etc. Decorate your area with pictures of different types of insects. Plan a pretend picnic. After all, insects are regular guests whenever we go on picnics. A gardening area with a variety of gardening accessories (toy versions) such as watering cans, empty flower pots, etc. Add gardening gloves, a sunhat, a cut hose, and knee protectors. Homemade insect puzzles (illustrations or pictures cut into pieces). Modeling dough and plastic insects children can press in the dough. Add flower-shaped cookie cutters. Modeling dough for creating unique critters. Actual insects captured in clear plastic containers. Association game involving insects (insects that bite, crawl, fly, etc.). Ladybug illustrations for counting spots. Association game involving colourful insects and flowers. Books about insects or dragonflies. Pictures of different types of insects to decorate the walls of your area. 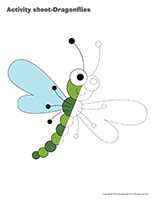 Connect the dot activities to draw a dragonfly or other insects. Activity sheets where children must find the differences or errors. Arrange chairs to create an obstacle course and invite children to crawl under them like ants in an anthill. Simon says…to act like different insects. With a jumping rope, draw a wavy line on the floor and invite children to crawl on it like a dragonfly. Wave a jumping rope back and forth and encourage children to hop over it. Pretend to fly like different types of insects. Pin the stinger on the insect. Stick a large bee shape on a wall and children take turns trying to stick its stinger as close to the correct spot as possible while blindfolded. Create an obstacle course and invite children to complete it as they hop along like grasshoppers. Place children in a circle and hand one child a ball of yarn. Encourage children to toss the ball of yarn back and forth to create what will look a lot like a spider’s web. Fill a large container with soil and add real worms to explore. Plastic worms and insects in a sand table. A water table with a few Styrofoam lily pads, a few plastic insects (dragonflies, praying mantises, etc.). Create a vivarium (or several). Simply add soil to clear plastic containers along with grass, insects, etc. Be sure to set a screen on top. 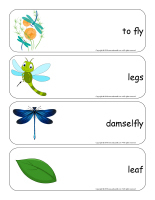 (Open word flashcards-Dragonflies) (Open giant word flashcards-Dragonflies) Print and laminate the word flashcards. Have each child pick a word and present it to the group (ex. wings). Ask them questions to see what they know about the theme. 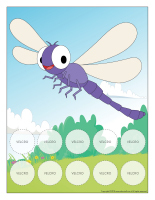 (Open educa-chatterbox-Insects) Print and laminate the cards. Cut them out and place them in an empty shoebox or small container. Add items, pictures, and illustrations related to the theme. During circle time or when children are waiting for lunch to be served, encourage them to take turns picking a card out of the box and naming what they see. 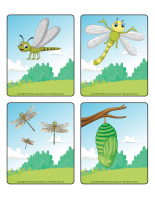 (Open story and memory game-Dragonflies) Arrange the cards face down on the floor or table. Children take turns picking three cards and using them to invent a story. If you prefer, print the cards twice and use them for a memory game. Trick: To solidify your game, glue each card on the top of a frozen juice can. (Open models-Dragonflies) Print two copies of each illustration. Stick one copy of each illustration on the table using adhesive paper. Set the copies in an opaque bag and have children take turns picking an illustration out of the bag to determine their spot at the table for the day. You may also use these illustrations to determine children’s naptime spots or for the task train. (Open models-Dragonflies) Print several dragonflies. Arrange them on the floor to create a path. Children will enjoy walking on the illustrations as they move from one area to another throughout the theme. (Open dragonfly hunt) Print, laminate, and cut out the dragonflies. Set them here and there throughout your daycare. If you wish, you can organize an outdoor dragonfly hunt by hiding them throughout your yard. Invite children to search for the dragonflies. They will enjoy using nets to collect them. (Open bowling game-Dragonflies) Print and use the stickers to create games. Glue them on empty soda bottles to create bowling pins. Set your bowling pins on a table and encourage children to make them fall using a ball. Give each child three tries. 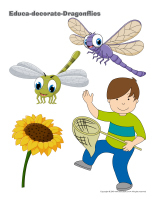 (Open stickers-Dragonflies) Print and use the stickers to create games. Stick them on empty metal cans. Use the cans to form a pyramid on a table. Children can try to make the pyramid fall by tossing a frisbee. Give each child three tries. (Open giant dragonfly pieces) Print, laminate, and cut out the pieces. Children sit on the floor and assemble the pieces to see a giant dragonfly appear. Close your curtains and turn the lights off. Create a series of obstacles and hang glowsticks throughout your obstacle course. At the end of the course, children can connect the glowsticks they collected to form a large circle of light. Glowsticks are easy to find in big-box stores and even at dollar stores. Use bracelets for this activity. Hide several plastic insects throughout your daycare. Give each child a flashlight and tell them they are dragonflies. Turn the lights off and encourage them to search for the insects. Every time a child finds one, he must say, “I found an insect!” and hand it to you. Where are the dragonflies hiding? Hide plastic dragonflies throughout your yard and invite children to search for them. Every time they find one, they must run to set it in a basket before going back to search for more. The game continues until all the dragonflies have been found. (Open roll and color-3D-Dragonflies) Print for each child. This game can be enjoyed individually or as a group. Children take turns rolling a die, counting the dots, and coloring the corresponding part. The first child to finish coloring his picture wins. (Open educa-symmetry-Dragonflies) Print. Children must color the bottom picture using the same colors seen in the top picture. 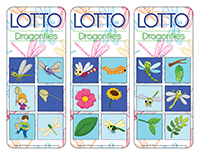 (Open lotto game-Dragonflies) Print the playing cards and pictures. Children take turns picking a picture and checking to see if it appears on their playing card. If it’s there, they set the picture in the corresponding box. If they don’t have the picture on their card, they must set it in the centre of the table. The first child who fills his playing card wins. Print several dragonfly pictures. Color them if necessary. Arrange several Popsicle sticks in a row and glue a picture on them. Cut around the outline of each stick and set each series of Popsicle sticks in a bag. Children will enjoy assembling these homemade wooden puzzles. (Open multicolored dragonflies) Print and cut out. Glue each dragonfly on a plastic Easter egg. Insert a glowstick in each egg. Children will enjoy napping with these lit-up dragonflies. (Open positive reinforcement system-My dragonfly) Print and laminate. Stick Velcro where indicated. Select a challenge or desired behavior that you would like to reinforce for each child. Every time a child succeeds or adopts the chosen behavior, let him add a colorful spot. When a child’s picture is complete, reward him with a special activity or privilege. (Open mandalas-Dragonflies) Print for each child. Encourage children to color the mandalas to help them relax throughout the day. Give each child a flashlight. Turn the lights off and close the curtains to make your daycare as dark as possible. Invite children to walk around the daycare and use their flashlight to observe objects. Hang miniature Christmas lights under a table. Drape a dark blanket over the table to create a hideout. Every morning, select a child who will be your “dragonfly of the day”. Let this child spend time in your dragonfly house. You may let him pick a friend who can accompany him. If you wish, he can also eat his snack and spend naptime in the dragonfly house. 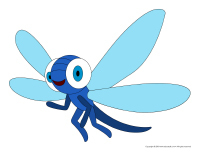 Make sure each child gets to be your “dragonfly of the day” during the theme. Turn the lights on and off in a rhythmic fashion. If your group is quite active, this can signal to them that it’s time to calm down. Have fun using the signal here and there throughout the day to provide children with the opportunity to practice gathering around you as quickly as possible. For each child, stick a glow-in-the-dark sticker on the tip of a Popsicle stick. 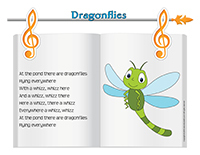 Turn the lights off and recite a dragonfly-themed rhyme or sing a dragonfly-themed song. (Open multicolored dragonflies) Print and laminate. Sit in a circle with your group. To the sound of music, children pass a few dragonflies around the circle. When the music stops, the children who are holding a dragonfly set it in front of them on the floor. The music starts up again and children pass another series of dragonflies around. At the end of the activity, count each child’s dragonflies to see who collected the most. (Open colorful flowers) (Open multicolored dragonflies) Print the flower models or cut several small flowers out of colorful construction paper. Set the flowers on the floor. Give each child a dragonfly. Make sure there are flowers of the corresponding color. This game is played like musical chairs, but without competition. Children walk around the flowers to the sound of music. When the music stops, each dragonfly must find its flower (same color). Before starting the next round, children can trade their dragonfly with another child. With very young children, use only two colors at first. As their color discrimination skills improve, add more colors. (Open dragonfly observation) Print for each child. Give each child a magnifying glass. Encourage them to use their magnifying glass to observe a miniature dragonfly so they can reproduce it and color the dragonfly that is next to it using the same colors. You will need clear containers, magnifying glasses, tweezers, pieces of tulle or screening, and pictures of dragonflies. Set up your own little dragonfly observation lab. Display the dragonfly pictures on the wall. When you go outside, provide nets children can use to try to capture real dragonflies. If they succeed, encourage them to use the magnifying glasses to compare them and identify differences and similarities. Press a glow-in-the-dark sticker on the tip of a Popsicle stick. Turn the lights off and observe the phenomenon. Use magnifying glasses, butterfly nets, and tiny clear containers with holes punched out of the lids to search for and capture different types of insects. Set children’s findings in the containers and observe them. You will need orange juice, 7-Up, and strawberry or peach yogurt. Mix everything together in a blender and pour the preparation into pretty glasses decorated with flowers. Enjoy your flower nectar at snack time! Purchase edible flowers and have fun tasting them with your group. 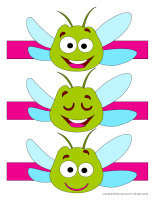 (Open educa-decorate-Dragonflies) Print and cut out. Glue the shapes on a construction paper headband. 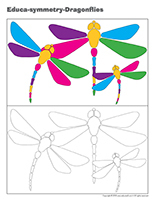 (Open models-Dragonflies) Print the models and use them for your various crafts and activities throughout the theme. 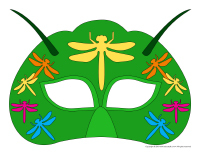 (Open masks-Dragonflies) Print and trace the models on cardboard. Children can decorate their mask as they wish. (Open puppets-Dragonflies) Print the puppet models on heavy cardboard. Have children cut them out and decorate them with a variety of arts & crafts materials. Stick a Popsicle stick behind each one to complete your puppets. (Open clothespin dragonfly) Print. Each child must have a dragonfly head and a set of wings. Ask children to cut them out. Have them paint a clothespin and set it aside to dry. Once the paint is dry, have them glue the head and wings on their clothespin. (Open models-Dragonflies) Print for each child. Have children color the items before gluing them on different lengths of string. Hang the strings from a hanger or an aluminum pie plate to create a mobile. Purchase a few colors of fluorescent paint. Invite children to pretend their paintbrush is a dragonfly flying very quickly over their paper, leaving traces of color behind. Fold colorful paper accordion-style and glue each piece of paper on a clothespin. Insert a black pipe cleaner in the opening on the clothespin to represent antennae. Have children thread a few beads on a pipe cleaner, making sure each child adds a few glow-in-the-dark beads on one end of his pipe cleaner (purchase them in big-box stores). Provide a second pipe cleaner that each child can twist and turn around the first one to create dragonfly wings. Use hot glue to add wiggly eyes to each child’s dragonfly. 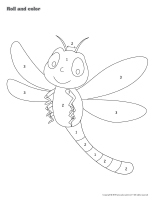 (Open coloring pages theme-Dragonflies) Print for each child.